This Citibank-Cebu Pacific Promo is Absolutely Amazing! Don't miss the chance to book low fares to local destinations from P599 and Hong Kong or Singapore from P1,599 with your Citi credit card. After receiving the email, I didn't waste time and booked a ticket for me as I have plans of going to Davao next year. And I have the round trip fare (without baggage) for less than 1000 pesos. Yes, you're right, less than a grand! 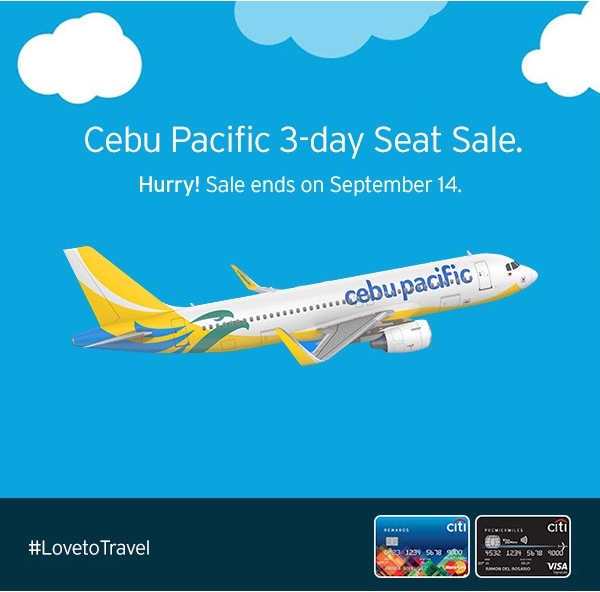 Citibank credit card holders just need to go cebu pacific website, search for a flight, and then on the next webpage, enter the promo code CITISALE in the box at the right side. I tried to do the same with Cebu Pacific mobile app for iOS but I cannot find it. I'm not sure about the Android version but I guess it would be the same. So for those who wanted to avail of this promo, just use a web browser, be it on your phone, tablet or your laptop or desktop computer. Screen grab from my email. This is a 3-day sale so it will end September 14, 2017 while the travel period for the discounted tickets is from January 1 to June 30, 2018. Please let me know if you discover how to enter promo codes in the mobile app if ever you found a way to. The comment section is a perfect opportunity to do that.